Hiding in My Craft Room: Day 9 of 12 Giveaways! Welcome to our 9th giveaway to celebrate the New Year! 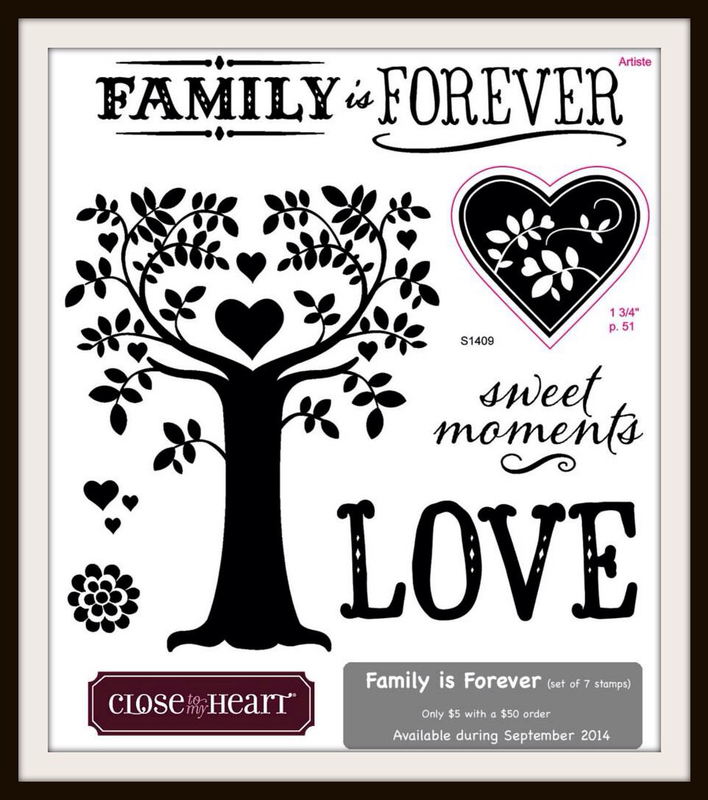 This set was a Close to My Heart Stamp of the Month in September. So if you missed it now is your chance! I love this set because my family is so important to me! In our church we try to set aside one night a week, usually on Monday's, to spend together as a family. Today we had Pizza in the Park! We got together with another family. It was so much fun but it turned a little cold and windy and us poor little Arizonians can't handle much cold so we had to cut it short! To get entered into this giveaway all you have to do is leave one comment sharing what you like to do with your family. We like to watch movies with popcorn of course, go to the park (obviously), and play board games! Oh, and Chuck E Cheese is a family favorite too! I love traveling with my family. It's fun exploring new places. When our kids were younger (they've all 6 grown up and moved away) we used to set aside one night a week as our family game night. Now whenever the kids come home I don't care what we do. I just enjoy our time together. We usually do family night either Friday or Saturday nights, although now that I work those nights, we sometimes do it during the day. Usually a movie, with tons of popcorn..and comfy clothes! My family is my favorite too. My boys and I like to get together and have bbq's or dinner and watch a movie. My sisters and I like to travel together and have fun. The holidays are filled with a houseful of extended family where the brother and sisters, their kids and grandkids get together and play board games. Thanks for your 12 days of giveaways...so very nice of you. My children are older now but we love to get together to eat and play games and eat again. It's so much fun to play games. Our favorite thing to do as a family is watch marching band performances. Of course our school band is our favorite but we've been known to spend too many hours looking up videos of bands on YouTube. A family fav of ours is to go to the Zoo. We make it a point to have our meals together at the table. I would love to sit and have a very nice dinner cooked by me and followed by a lovely yummy dessert. This is a lovely stamp set. Thank you. That is a wonderful tradition that your church encourages. Our church takes every 7th week off from through the week meetings so we can rest and enjoy our families. We started a new weekly tradition in our family where we spend about 30 minutes worshiping to music. Then we each select 2-3 prayers to say from our family prayer box (of course I crafted it). There are prayers of petition, thanksgiving and declaration; most include scriptures. We each contributed something. I typed the prayers, found scriptures to go with them, printed them out, cut them into strips and deposited them into the box. We never know what we are going to pull out and it is often uncanny how fitting the prayers are for the moment. Thanks for doing all of these wonderful giveaways. I especially enjoy the sharing part. It is a prize in itself. Such a wonderful giveaway! Pretty stamp set! It's a pretty stamp set. We enjoy games and just talking together. I do not have any children but I like to take my nieces and nephews to the Library or to the movies. Such a pretty stamp set! We do lots of things together...movies, vacations, beach, shopping (although the kids don't always like that one!). Sometimes what I like most, playing board games together as a family. Love this stamp set! My two children are grown now but I visit with the grandkids every other week to help my daughter out and spend time with them. We just do everyday things, like crafting and reading books, but it's a great way to get to know the kids and their routines. I love being able to spend that time with them! Our family likes to hike and camp out. We did that a lot while our kids were young. Now that they are older we get together as much as we can and hike near our property. Lots of fun things to see in nature. When the kids were still at home (they've insisted on growing up, getting married and moving out...sigh), we loved to play miniature golf as a family. We enjoy game night, everything from dice and card games to Wii Bowling and other video games. If it's not eating out or swimming in the pool on a Sunday afternoon, we try to plan a weekend getaway twice a year. this year we went to our ski club during the summer and ate, told stories, hiked, visited the museum, and walked on the Pacific Crest Trail. It was a great weekend. Time to plan another one. thanks for the giveaway. One fun activity we like to do with our two little girls is camping out in our family room. We started doing that when our oldest was 2 years old and I didn't want to hassle a real camping trip. Now they love having our little camp-outs any time of year. We roast marshmallows over our barbeque, and then camp out in the family room with sleeping bags. Safe, and fun...and no mosquitoes! In 2013 I moved with my boyfriend to the seaside, nearly 700 kilometers from our home town. I don't have any family near here, except my boyfriend/partner. Two of us love to watch documentary movies and spending our days outside in nature. When visiting my parents, brother, sister in law, nieces and the rest of my family, I just love to spend time with them, no matter what we do. Family really is very important. Me and my hubby are expecting our first baby and we're really excited. Can't wait to play with the little one. I'm sure we'll have a wonderful time together. But while we are still alone, we like to watch some movies/shows or/and go to short trips around the country. Oh, we also enjoy Geocaching. So much fun! Thank you for the chance to win this wonderful stamp set. We like to go to the beach. We even went on Christmas Day because it was a beautiful 65 degrees (we live in southern New England). Our girls went swimming, but it was way too cold for me!! Thanks for the chance to win. I am very blessed to have a family who is active and love sports. We are all absolutely golf-lunatics, and in wintertime we sure have blast doing alpine skiing. Thanks for the great prize and chance to win it. Such a great set! Our family runs and hikes together! Our family doesn't really do a lot of outings together since my boys are still young, but I do spend a lot of time reading to them, crafting with them and an occasional board game. We like either getting together at my house for meals or going out (my daughters are all grown and are on their own).